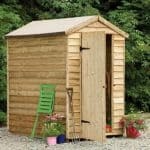 If you live in an area that is often exposed to storms and heavy winds, as so much of the United Kingdom is, then you need a strong and stable garden shed that will stand up to it. That’s exactly what we have here, which is why we feel that this will be a very popular timber garden building for those who have the budget to afford it. It has a traditional, almost rustic, style that we like, and at the top of it sits an apex roof that, along with the elevated eaves, give it a bit more vertical height. This means that there is even more storage space than is apparent at first sight. The eaves aren’t the only thing raised about this shed, as it sits upon pressure treated floor joists. 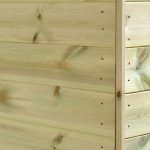 This, along with the tough cladding used throughout, ensures that it has excellent defences against precipitation and rot, which is why the manufacturer has been able to supply a long 15 year warranty. The cladding also ensures a dry interior, and we feel that it’s a pleasant environment to spend time in. There’s lots of light provided by two tough windows, and we were pleased to see that they open to provide a natural source of ventilation. This is a traditional timber apex shed that makes the most of modern technology, to create a durable garden building that we also found very appealing visually. We think it should fit in with gardens of all shapes and styles, and despite its relatively compact footprint it can hold a lot of equipment and tools inside. The apex roof at the top gives the shed an impressive height, and being made of tongue and groove cladding covered with mineral felt it’s also very effective at channelling rainwater safely away. 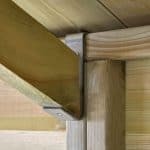 The ridge height is 2.31m and the eaves height is 1.72, both of which are greater than those seen on many timber sheds we review. 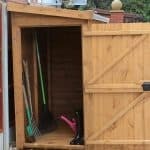 When selecting a spot to position the shed, you’ll also need to know the overall width of the shed, which is 2.44m, and the overall depth, which is 3.63m. 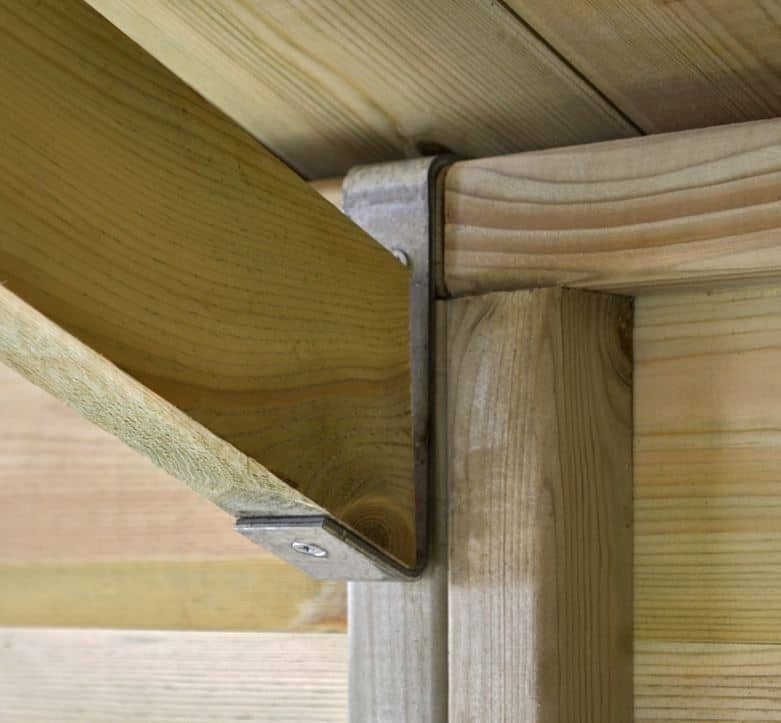 With cladding so important for the stability of medium and large wooden sheds, we were very pleased to see that tongue and groove had been used throughout, that is for the roof and floor, as well as the walls. This means that all areas of the shed have excellent moisture repellency thanks to the tight interlocking of the substrate. The cladding is 12mm thick, which is what we often find in sheds of this size, but the framing was slightly thicker than some at 34 X 34mm. This gave it an excellent and reassuring stability. The tongue and groove floor should take most weights without a problem, and it was good to find that it was supported by pressure treated floor runners. This elevation protects the floor from the threat of rising ground moisture, and adds to the longevity of the shed as a whole. The runners aren’t the only components given the pressure treatment. In fact, all the timbers have had wood preserver forced by pressure deep into their fibres. 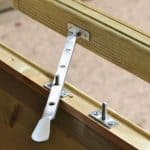 This gives them lasting protection against rot, particularly when compared to many sheds we review that have only had a dip treatment of wood preserver. The manufacturer’s are very confident in its anti-rot properties, as are we, so it was very good to see that they had backed this up with a best in class 15 year warranty. 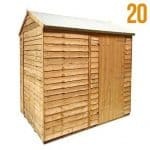 The warranty doesn’t place any emphasis on retreatment by the customer, either, but as with all wooden sheds and workshops we recommend that they’re inspected on an annual basis, and then retreated if required. We’re used to having to duck down when entering shed doors, so we were pleased to find here a single door that was unusually accommodating. The width of 0.89m is significantly more than that found on most single doors, and in conjunction with the height of 1.80m means that there are no problems moving tall or wide objects in or out. There are two windows, and it was good to see that they are fully opening rather than being fixed in position. This means that both ventilation and temperature can be easily regulated, creating a pleasant atmosphere filled with natural light. The side panels are interchangeable, meaning that the windows can feature on either the left or right, which we think is a nice touch. The door and windows themselves give a basic level of protection against an attempted break in, with the door being fully braced and featuring strong hinges, and the windows including shatter resistant toughened glass. 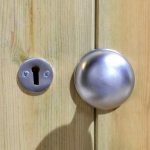 Added security is provided through the inclusion of a key operated locking system, meaning that you’re shed door can be just as reliable as your front door. 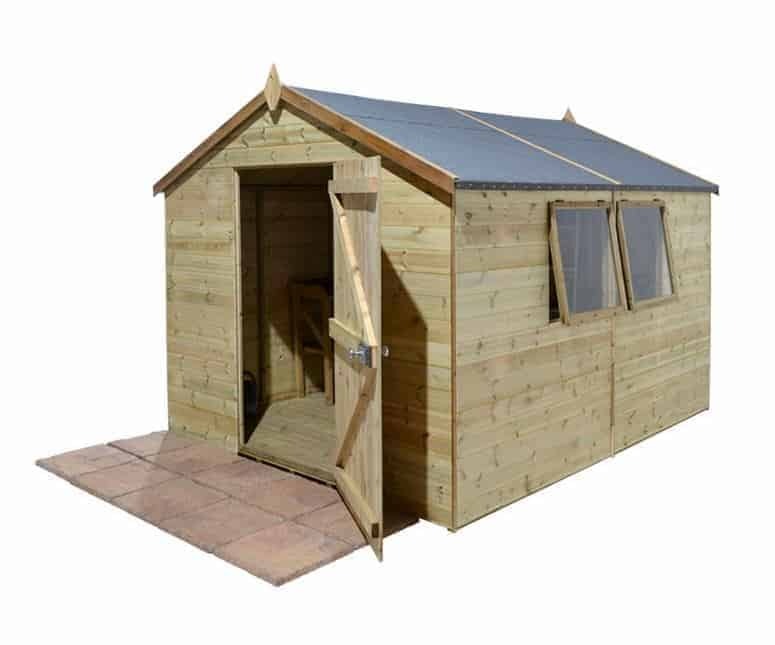 We think the standard apex roof provided with this shed does an excellent job, but if you prefer the look and performance of a slatted roof this can be added, although it does come with a price tag of £379.99. 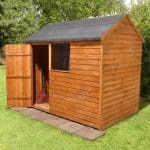 More affordable, and very useful for many people who’ll use this shed, is a 12X8 custom made workbench, and there’s also the chance to take advantage of a professional installation. This option certainly saves time, and possibly frustration if you’re not used to DIY or assembling sheds. 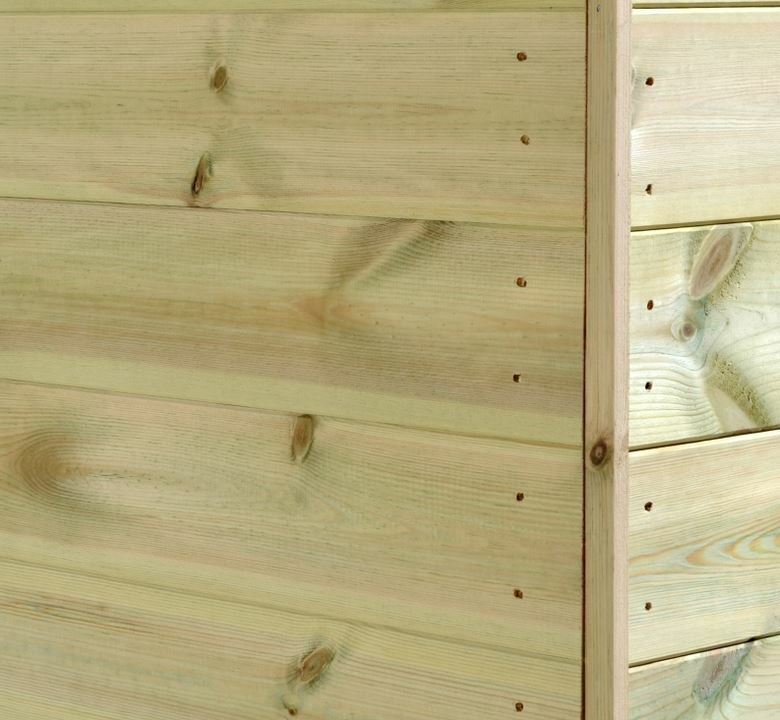 We always expect quality with this manufacturer, and that’s just what we found here as epitomised by the use of tongue and groove cladding on all the surfaces. 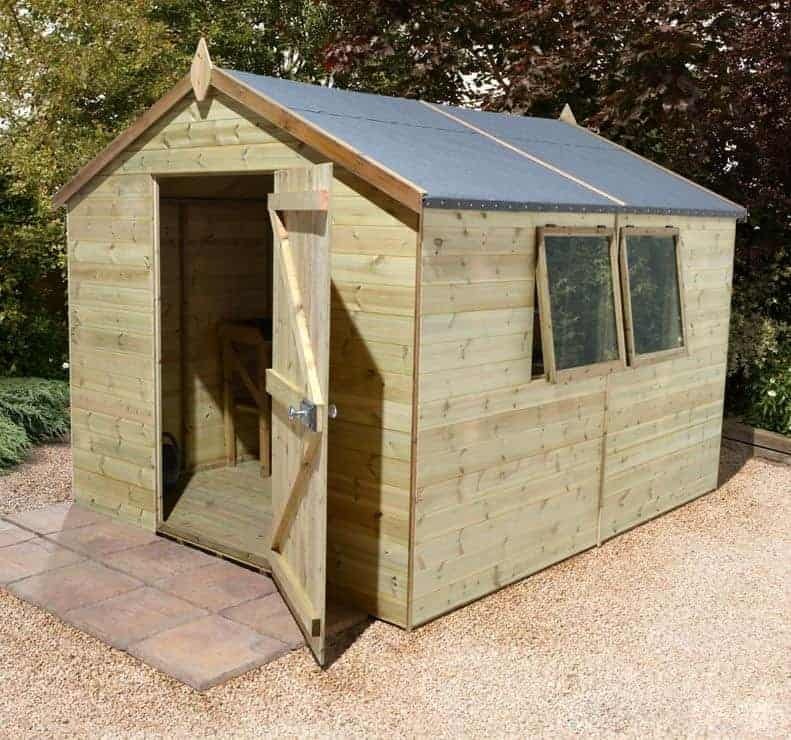 Durability is one of this shed’s key features, thanks to its tough cladding, floor joists, and pressure treatment, so it was pleasing to see this reflected in a 15 year warranty against rot. Raised eaves give a very useful amount of extra vertical storage space, and we recommend the installation of shelving to make the most of this. 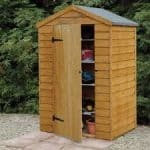 You’ll need at least two people to erect this shed, and we advise reading the instructions carefully before starting the installation. You should then be able to complete it in around six hours, or you could of course pay for the optional installation service. We have seen sheds that are considerably cheaper than this one, of a similar size, but this does provide excellent quality and is packed with features. 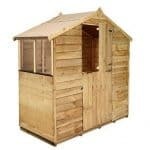 Final Thoughts: If you don’t mind paying more than a thousand pounds for a medium sized timber shed then this has a lot to recommend it. Indeed, the only slight negative that we have about is that it needs to be painted to prevent it silvering over time due to UV from the sun. 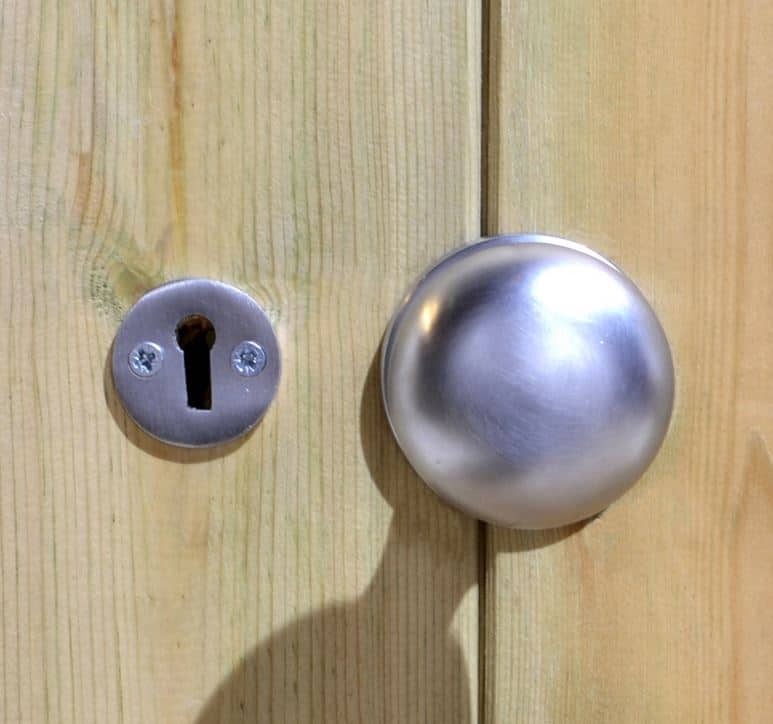 Other than that, it contains everything we look for in a timber shed, including opening windows, pressure treated floor joists, tongue and groove cladding, and a tough and secure locking system.You’ll get peace of mind from knowing that your contents are dry, and from knowing that intruders are likely to be kept at bay.